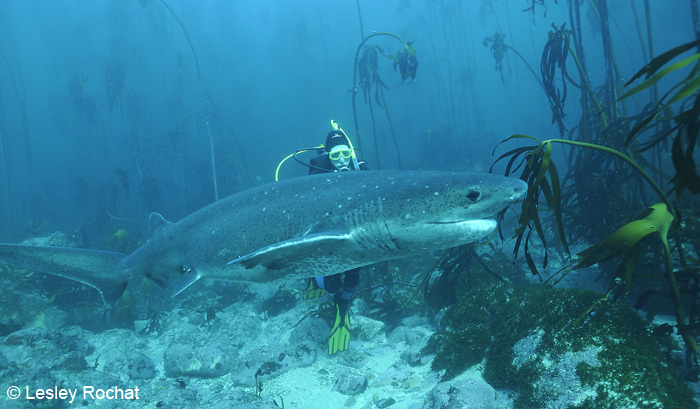 Awesome Dive with Seven Gill Sharks! 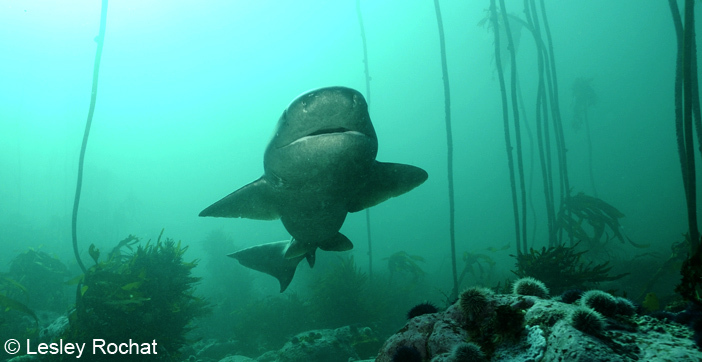 It’s a beautiful day in False Bay and I’m on Mike’s boat (of Pisces Divers), heading for the seven gill shark dive. I confess I live here but for various reasons I have not done the dive yet. 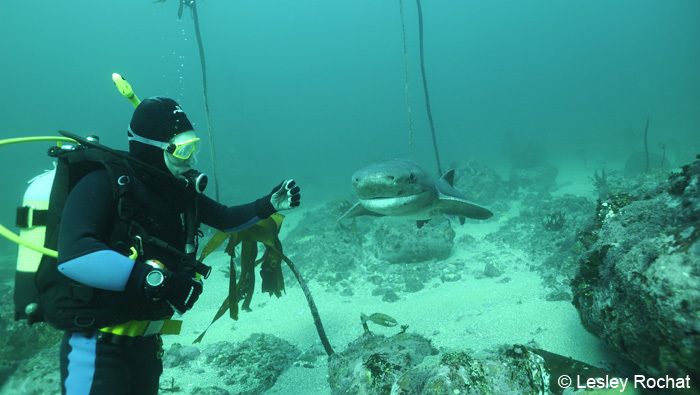 As a shark conservationist it has got to the embarrassing stage: “What, you haven’t dived with them yet and you live here, (and you’re a shark conservationist)! ?” Though people don’t say the last part, I know that’s the subtext of their remark. The viz looks good, 10-12 metres, that’s good for False Bay, and the temperature is around 14 degrees. I’ve been spoilt with my international travel and warm water dives, and given my lack of body padding I struggle in this cold water. I decide I should last about 30 minutes before I start turning blue. David Bligh, from East London, who I have just met, is my dive buddy. A backward roll, camera in hand and wow, it’s been a while, I’ve forgotten how beautiful our kelp forests are! I hang for a bit taking in the skinny, long arms of kelp that stretch proudly to the surface, their gentle, swaying hands and long fingers reaching for the sun. One part of the group head left, I look right, it looks like a better option. Soon thereafter my first sighting of a seven gill shark: I take in her dark grey spotted body, pretty eyes, odd dorsal fin so far back, and a tail fin which makes me think a little of a thresher shark. Indeed prehistoric looking. She swims passed me, closely, familiar with divers it would seem. In the distance I see another larger female weaving through the kelp and follow, and then the shadow of another. I estimate maybe 6 different animals on the dive. As always I’m struck by how fragile they are, it could take just one demersal line to wipe this little group out. Though this is a marine reserve, the seven gills don’t stay here and are often killed by fishermen not too far away. I’m consumed by the beauty surrounding me and ignore the biting cold, lasting 46 minutes till I surface. All I can think of is why I haven’t done this sooner, that I’m definitely coming back soon, especially with my strobes working, and how I must get more signatures for the AOCA petition which includes protection for the seven gills.If you’ve read this far please sign the petition which I will be presenting to our fishery department this year and help AOCA to help them, thank you! 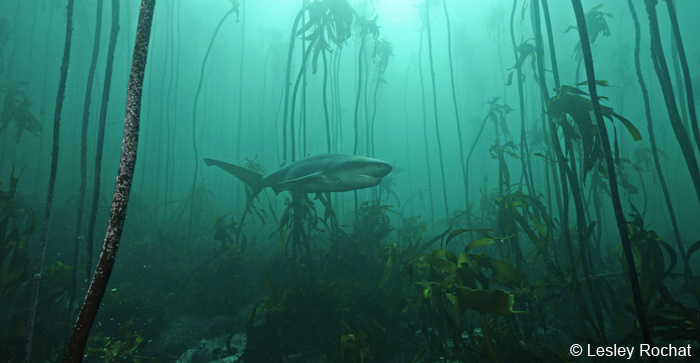 I know that feeling diving in those kelp forests – man it get’s cold. It seems those seven gills were pleased to see you at last – they’re smiling! I’m envious of your getting out there! 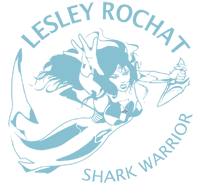 I talk with people out and about, most do not know about shark finning! population does not act fast, they will be gone in five. the shark fin a thing of the past. 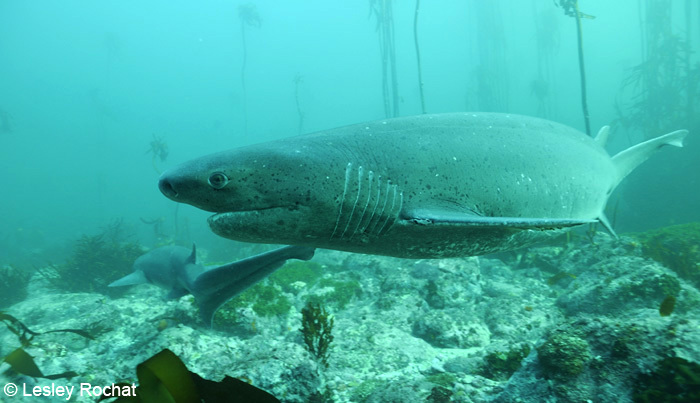 sevengills do not face much threat from finning, as they lack a prominant dorsal fin.